Not all Metal Prints are created equally. There is a difference when comparing one lab to another and at Shiny Prints, our quality outshines the rest because we invest in the absolute best equipment and materials in every step of the process. We only use ChromaLuxe panels which are the industry standard for professional photographers and artists. There is simply no alternative and all other options fall flat in comparison. ChromaLuxe panels are proven to last over 65 years (source 1) (source 2). We also only use the absolute highest quality printers in the industry, the F-series Epson printers provide the sharpest and widest gamut prints for the dye sublimation industry (source). Other labs cut corners to maximize their profits by using converted printers and 3rd party inks which produce blurry and washed out prints. 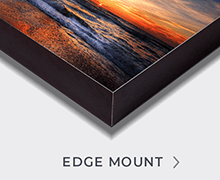 We elevate the integrity of our products by avoiding cheap looking wood backings and mounts that diminish the quality of the overall print. We only print on metal and we do it right. Make sure you get it right the first time by choosing Shiny Prints. We don't just carry the largest selection of standard sizes, we can also custom cut any size print and shape at the most competitive rate in the industry. For custom shapes, please contact us. We have the lowest prices for HD ChromaLuxe metal prints in the industry, but if you do happen to see a lower advertised price, let us know and we will match it! Not all metal prints are HD. 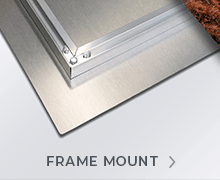 We only use top of the line ChromaLuxe aluminum panels. Don't be deceived by other labs that use different processes or inferior metal, ChromaLuxe is the industry standard for high-end prints used by artists and photographers. We CNC cut our aluminum panels for a mirror finish. Never settle for shear cut panels. We only use the absolute best industrial equipment and materials to create your prints. Our Epson F-Series line of printers were specifically manufactured for the dye sublimation process and offer the sharpest prints in the industry along with the widest color gamut. Do not settle for a lab that uses converted printers with aftermarket inks. Unlike most labs who only support the sRGB color space, we let your colors glow and shine with the larger adobe1998 color space. Our profiles are regularly calibrated to ensure the most accurate and true colors to a calibrated monitor. 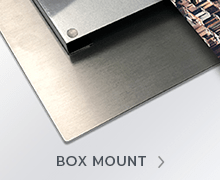 We offer a wide assortment of backings and mounts which are all made from aluminum. 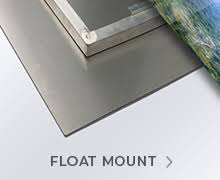 Float mounts and box mounts are included in the price, or you can upgrade to a frame mount, tuxedo mount or edge mount. Our capabilities allow us to print as large as a 48" x 96" and 48" x 72" for your standard 2:3 ratio prints in a single sheet, even larger for multi panel prints. Have confidence knowing you will never outgrow your print lab. We cater to professionals by not only having the best quality and pricing, but we also have special pricing for our professional customers who resell their art. If you're a professional artist or a photographer who is in the business of selling your prints, request your account be upgraded to pro pricing. Why choose metal over other printing mediums? Above everything else, you want a substrate that makes your photos stand out! Prints made on ChromaLuxe metal panels create visually stunning pieces. We are able to produce deep blacks, and rich, vibrant colors that bring your image to life in a way that no other medium can. 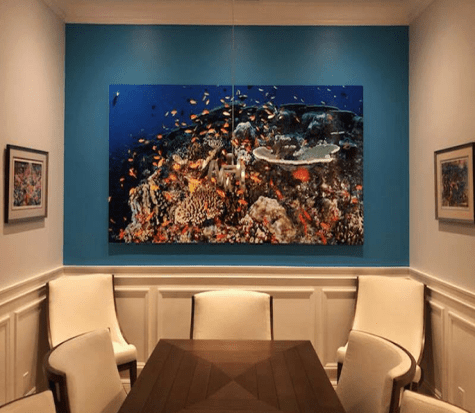 While aluminum prints are best known for their use in the fine art industry, they also work incredibly well for signage purposes used in both indoor and outdoor settings (see our EXT option). Their dry erase properties make them a great option in commercial settings. Metal prints can be used to create diagrams and charts in such fields as business, restaurants and architecture. Metal prints are more scratch resistant than anything else available on the market. They are waterproof, they will not rust, and they can be placed in areas such as bathrooms, kitchens and outdoor spaces where most other prints will not hold up. Metal prints can be framed in any standard wood or aluminum frame, or they can be edge mounted for a more finished look. Aluminum prints can be adhered directly to a wall, but are also rigid enough to stand on their own, so they can be hung as signs using standoff posts. What sets Shiny Prints apart? Every square inch of our production facility is dedicated to this process, which allows us to devote our time and attention to perfecting this specific type of printing. We have been printing on aluminum for longer than most labs. Several labs outsource to Shiny Prints because they trust our experience and expertise. We have the ability to produce large quantities of work with the same precision and care that we offer for custom and creative projects. Professionals demand the best, and we know how to deliver. Rest assured, Shiny Prints is accustomed to working with professionals who demand quality - and we make sure that we deliver. We do everything we can to make sure our clients have a positive experience. We stand by every one of our products and will replace any print that is deemed defective, or that was produced in error on our end. We are available to assist you with any questions or concerns you may have. Please consult our Contact Page for our hours and availability options. Any image can be printed on metal and be called a “metal print,” but quality varies from business to business. At Shiny Prints we create high quality metal prints that are vibrant and detailed. 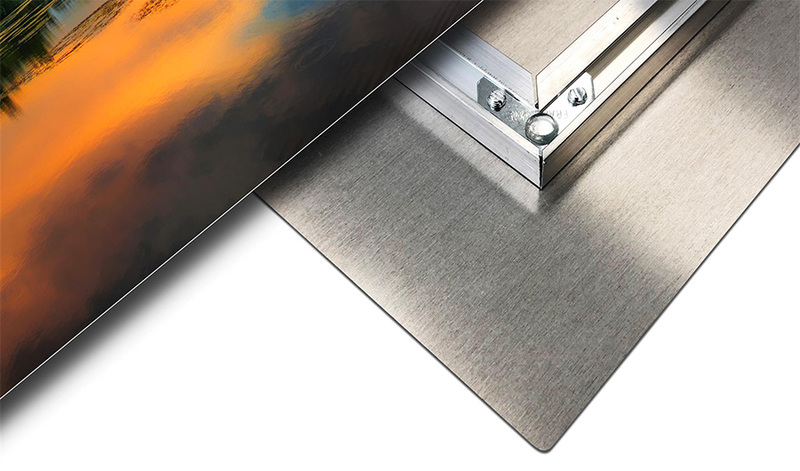 Our quality metal prints are produced on ChromaLuxe panels using a dye sublimation process. These prints can be found in art galleries, high-end boutiques, and craft shows; they capture your attention with their amazing range of color, depth, and detail. Shiny Prints is an authorized ChromaLuxe Lab; therefore we guarantee the highest quality metal prints on the market. The process we use to create our high-end prints is known as dye sublimation. First, the image is printed onto a transfer paper which is first mirrored in the printer RIP software. Once the image is printed on the sublimation transfer paper, the transfer is applied on top of the specially coated aluminum panel where it is adhered using tape that is resistant to high temperatures. Once applied to the panel, the substrate is "baked" in a heat press that uses heavy pressure along with 400 degrees of heat to infuse the ink into the coating on the panel. After about 2-3 minutes, the heat press will drop, and the print will be ready to cool off and then mounted. The dye sublimation process is the only way to produce HD metal prints since it is printing all the way through the glossy coating as opposed to printing on top of the substrate like many print processes do. Get the most out of your prints by establishing a relationship with Shiny Prints. We don't just take your files and run them through an automated system like most labs; we care about you and your business. When you create an account with us, someone will follow up with you to welcome you to the family and go over any questions you may have. We work with many professional businesses, large and small, and we know that communication is vital. We empower our clients through education; we explain our process and how to avoid common errors when submitting files. We also make it easy for professionals to place orders by offering a Quick Order System that allows you to compile a full, large-quantity order on a single page. For your convenience, we blind dropship directly to your customer when our system detects the shipping address differs from the billing address. Once you have uploaded your files, we can save them locally so that you can easily reorder in the future without having to reupload. Our website accepts both TIF and JPEG file formats, and can accept files as large as 2GB. Not a pro? No problem. Our Easy Order Wizard makes placing an order a breeze; we walk you through the entire process. Whether it’s a small 8x10 gift, or a 24x36 statement piece for your bedroom, we make your ordering experience seamless; just select your size, upload your file, and checkout. 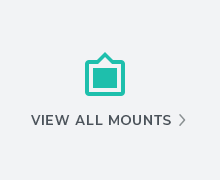 Our step by step system will tell you whether or not you have the proper resolution, and will let you crop your image as you place your order. If you are new to Shiny Prints Order Wizard, check out our web-ordering tutorial. The most popular surface to print on is white gloss, so if you're new to ordering metal prints, this is the surface you want to go with. We cater to many businesses for unique installs that require a hands-on approach. We have in-house designers and artists that can work with you to develop a plan specifically tailored to your needs. Our prints work well in settings such as restaurants, hotels, offices and learning centers due to the durability of the aluminum. 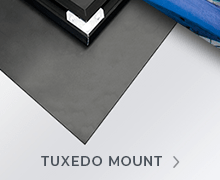 Our EXT surface option is perfect for outdoor signage applications. Our equipment and staff are well equipped to handle any commercial job. Contact us today to get started on your next project. Copyright © 2019 ShinyPrints LLC.